Healthy snacks are even better when you whip them up together. You know that healthy snacks are important for your kids. Making them together adds an extra layer of goodness: When kids take ownership by preparing food themselves, they're more likely to be excited about it—and more likely to eat it! 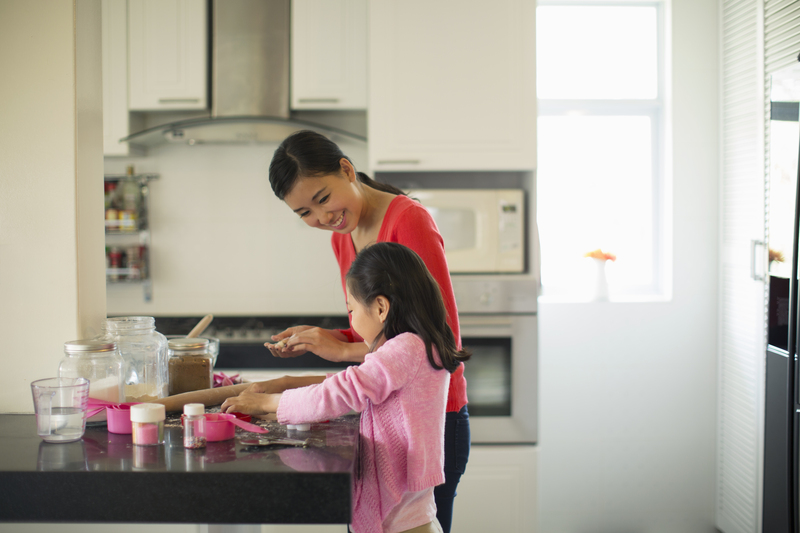 Here are five snacks you can whip up together that are easy to make and loaded with the kinds of nutrients kids need, like protein, calcium, and fiber. Frozen Berry Bites: Dip blueberries and halved strawberries into yogurt (use a toothpick to do this) and place on a baking sheet lined with parchment or waxed paper and freeze until firm. Tangy Yogurt Dip: Stir seasonings such as garlic powder, onion powder, dill, and parsley (or use a pre-made ranch seasoning mix) into a cup of plain yogurt and serve with carrots sticks, cucumbers, and pepper rings. Creamy Hummus: Blend a can of drained chickpeas with a half-cup of plain whole milk yogurt, a garlic clove, and salt in a food processor, then drizzle in enough olive oil to get the consistency you want. Serve with wedges of whole grain pita bread. Apple Nachos: Slice an apple and arrange the slices on a plate. Heat a small dish of natural peanut or almond butter in the microwave for 10 seconds or until thin and smooth. Stir almond butter and drizzle it over the apple slices using a spoon. Sprinkle with mini chocolate chips and unsweetened dried coconut. Fro-Yo Bark: Spread vanilla yogurt on a baking sheet lined with wax paper. Sprinkle yogurt with sliced fresh or dried fruit, nuts, and chocolate chips. Freeze until firm and then break up into pieces to nibble. Store any leftovers in a container in the freezer. Banana Split: Peel a banana, cut it in half, and lay flat (cut side up) on a plate. Drizzle yogurt over the slices, sprinkle with granola, and refrigerate for 1-2 hours. Eat with a knife and fork.